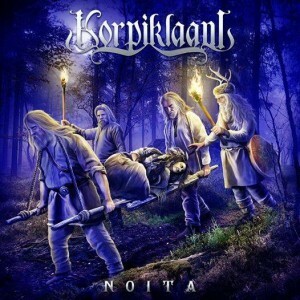 Lords of the infectious jig, Korpiklaani, are back with their ninth studio outing, Noita. The album is generally themed around the idea of the shamanic healer or ‘noita’, but, as suggested by both the dark artwork and the hint of sadness in some songs, the album evokes a certain sense of mourning for a bygone era. The songs themselves, while still fast-paced and toe-tapping romps, all seem to have been written in a minor key: they feel heavier overall than on previous albums, and less light-hearted in tone. Even the token song about beer seems sad! ‘Sahti’ is an ode to a very old Finnish beer, and one I’m very keen to try having heard the song. 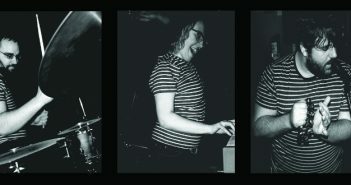 It still has a strong pace to it, but in comparison to the fan favourite alcohol-related songs ‘Vodka’ or ‘Tequila’, it is almost a dirge, though the accordion riff halfway through clearly demonstrates that new member Sami Perttula has both considerable talent and has meshed very well with the established line-up. 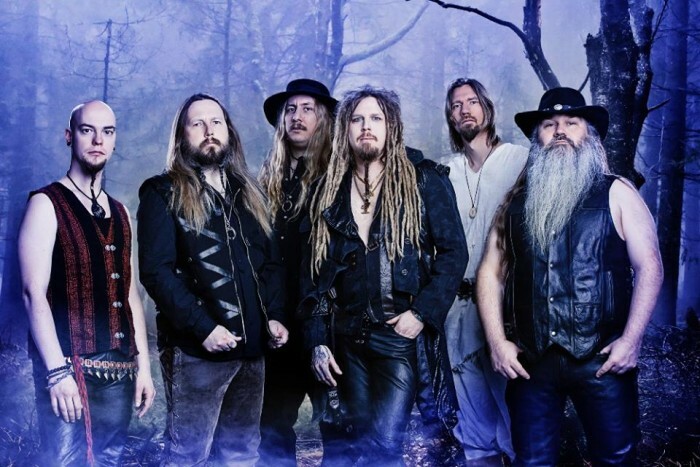 But the minor key the song has clearly been written in seems at odds with a subject matter that has previously had a fairly cheerful treatment from Korpiklaani. Indeed, nearly all the songs on the album seem to evoke a sort of melancholic nostalgia, noticeable most clearly on ‘Pilli On Pajusta Tehty’ and ‘Lempo.’ The latter is a tribute to the Finnish sky god of the pre-Christian era, and is the album’s slowest song. This slower tempo and minor key, to me, seem to indicate that ‘Lempo’ is an ode to that pagan era, which has almost passed into myth due to the influence of Christianity, which demonised its shamanic healers and their followers. Clearly the pagan myths of Finland resonate with the group, as nearly every album has songs dedicated to them: Tervaskanto had ‘Veriset Äpärät’ and Manala had ‘Tuonelan Tuvilla’, to draw but two examples. However, on Noita the band seem to be mourning the loss of these pagan myths from Finland’s general consciousness, as represented by the traditional, shamanic healers. As explained by vocalist and frontman Jonne Järvelä in an interview with Terrorizer, such healers were branded as witches by Christians expanding their influence through Finland. The album’s artwork actually depicts a scene from the track ‘Ämmänhauta’, telling the story of how one such healer is buried in the woods in secret due to this persecution. This thread of sadness does seem to run through most of the songs on the album, but that should not detract from listeners’ enjoyment of it. Noita is the first to include new accordionist Sami Perttula, and his use of the more traditional button accordion, as opposed to Juho Kauppinen’s keyboard accordion, does not seem to have thrown anything out of joint; the button accordion sounds a little crisper than the keyboard, but that is the only sonic difference I can detect. Perttula and violinist Tuomas Rounakari clearly have great musical chemistry together, shown most clearly on ‘Sahti’ and ‘Viinamäen Mies’. This, in turn, strengthens the music as a whole, which is only a good thing with a new member in the ranks. Noita‘s general sound is pretty similar to previous albums, but the new members make it seem fresher. The metal is also heavier than it has been for quite a while: the bass is quite prominent, almost punchy, on songs like ‘Pilli On Pajusta Tehty’, and the guitars are louder and more raucous than on either Manala or Ukon Wacka. However, the album does get a tad repetitive by the end. After ‘Juoni Juoni’ the songs seem to sound very similar, which even the NWOBHM-flavoured ‘Sen Verran Minäkin Noita’ does little to alleviate. Perhaps some instrumentals like the shamanic ‘Husky Sledge’ and the mournful ‘Dolorous’ from Manala might have worked better on Noita than they did on Manala, just to break up the pace and let the listeners’ feet stop tapping for a while. Such instrumentals would also have given Perttula and Rounakari more time to play off each other, something I hope to hear more on future albums.